Irene (1903-1981) was the daughter of William John Qualtrough (1851-1916) and Alice Mylchreest, and her Grand-parents were William Qualtrough (1825-1896) and Margaret Kinvig (1826-1899), (See Chart 23). I remember Irene Eva Qualtrough. I was quite young, and she was my grandmother’s friend, known as Renee – pronounced Ree-nee. 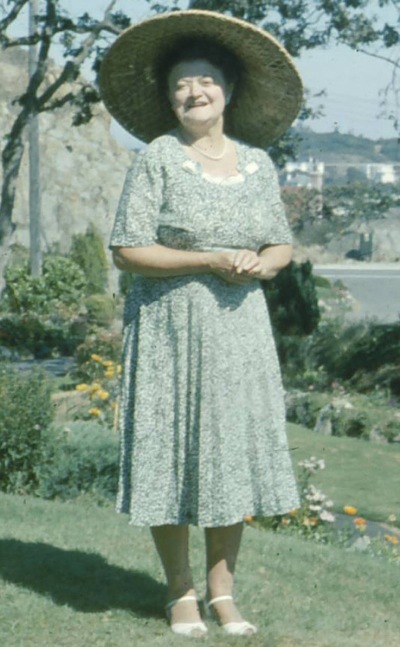 She lived in Victoria BC Canada and worked as a companion to a wealthy woman, whose family owned one of the nicer clothing stores in town "Mallek's". As a child I knew that Renee had an accent; however she had very dark hair and I in my childish mind I thought perhaps she was French. My mother provided me with Renee’s last name a number of years ago and I just came across it, so being a serious student of genealogy, I immediately looked her up and found the Qualtrough Family Web Site. My father remembers that Renee worked for/lived with Mr. and Mrs. Tom Cannon, the managers of the apartment building in which he grew up. Checking immigration records, I see that Renee came to Canada in 1924 to work for Mrs. T Cannon of 2033 Fort Street in Victoria BC. Dad recalls that Mrs. Cannon was Renee's aunt. Renee came to our family home with my grandparents for Christmas dinners. She kept rooms downtown so that she had a private place to go, however she mostly lived in very nice homes in Victoria. As a child I was taken to visit her at one of these homes; I remember the grounds being huge and the home large and very quiet. Renee had a picture, a painting done by a local artist, which she gave to my grandmother for safe-keeping. She and Grandma lost touch, and the painting stayed with Grandma – I have it now and I often think of Renee and how sad it was that she seemed so alone in the world – until today I did not know when she died. I found that even though her death was registered with her correct birthplace and date, no one knew the names of her parents. I am pleased that in some way I am able to 're-unite' Renee with her Qualtrough family.